5 Pages Infographic Resume Template - Resumes Mag. Resume 3 – A Resume Template with an infographic representation includes 5 pages, Cover Letter, Portfolio, and it is available in four different colors (blue, red, green and yellow). The Template is editable in various file types including (PSD, INDD, AI, EPS, DOCX). Three layouts…(Resume, Cover Letter, Portfolio). A4 & US letter paper size. Files are print ready (CMYK). Supported Applications: Microsoft Word (DOCX), Adobe Illustrator (AI), Adobe Photoshop (PSD), Adobe Indesign (INDD). Available in four different colors (blue, red, green and yellow). Global swatches (AI and INDD), to change the global color at a glance. Organized in layers and layer groups (PSD). More than 90 icon varieties available in the download package. 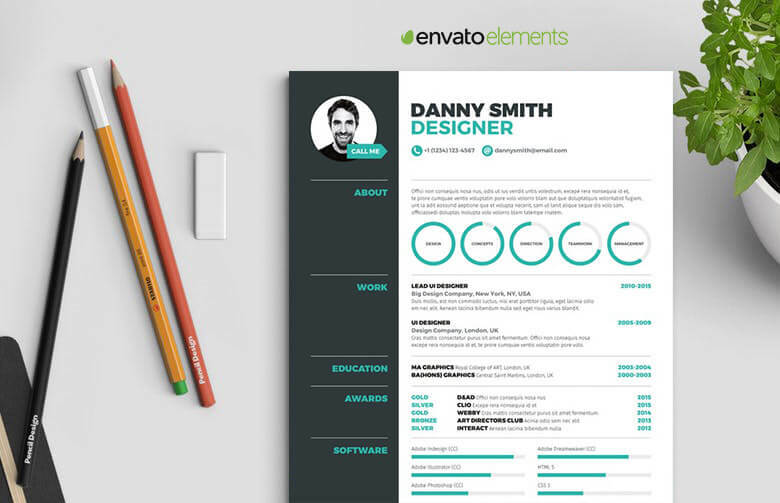 This resume template is designed by Ikonomi from Envato Elements.